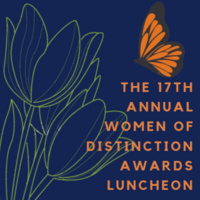 This annual awards luncheon recognizes women-identified Pacific students, faculty, staff, and members of the Stockton community, who have made significant contributions to the advancement of women and gender equity, and/or who have demonstrated outstanding professional or public leadership. Six awards are given each year: Pacific Staff, Pacific Faculty, Pacific Greek Woman, Graduate Student, Undergraduate and Stockton Community Member. Kelly Masterson, a fourth-year student in Media X. Masterson entered University of the Pacific wanting to help make a difference by sharing important messages through the medium of film. While she is still heavily involved in digital media, she has evolved her passion and has started her master’s in education while she finishes her bachelor's degree in order to be more hands-on in bettering our society. Qiana Amiad Moore, a second-year graduate student in the Department of Communication. After receiving her BA from the University of California, Los Angeles, she worked in development and event planning at UCLA's Graduate School of Education and Information Studies. A Stockton native, Moore returned to her hometown to pursue a masters in communication with a concentration public relations and media in hopes of effecting positive change in the way her community is portrayed in the media. Aseel Baluom, a third-year speech-language pathology and audiology major with a minor in business management. Baluom is the president of Alpha Phi, a member of Theta Alpha Phi, a member of Hall Government, and a Pacific Ambassador. She plans on pursuing her Doctor of Audiology after completing her bachelor's degree. Erin Rausch, director of the Center for Community Involvement. Rausch splits her focus between community change, social justice, student development and her passion for being outside. At Pacific’s Center for Community Involvement she connects the university community with opportunities for service through youth programs and volunteer efforts in the Stockton community. She is a foster parent and mother of a two-year-old son. Dr. Cathy Peterson, PT, EdD, ATP; professor and chair of Physical Therapy in the Thomas J. Long School of Pharmacy and Health Sciences. Peterson joined University of the Pacific in 2002. She has traveled extensively on behalf of the university, as well as organizations including Health Volunteers Oversees and Hope Haven West; and served as a Fulbright Scholar to Malawi in 2012. She has dedicated countless volunteer hours providing mobility solutions through seating clinics and wheelchair distributions in developing countries, and has created numerous experiential learning opportunities who accompany her. Her greatest professional joys come from inspiring students to challenge themselves in the classroom, in the clinic, and in life. Janie B. Reddish, an outstanding retired school administrator and educator. Reddish is an active citizen in the Stockton community and serves on many boards and committees. She is president of the Stockton Sister Cities Board/Association, chair of the Stockton Women’s Collaborative, and an alumna member of The Stockton Links Inc., among other areas of service. Mahrukh “Maya” Hasan '07 SIS, COP - Maya Hasan is the Principal and founder of Azura Labs, an international development consulting firm providing public service design and impact measurement services to organizations working in complex environments. A woman of color, humanitarian, entrepreneur, designer and researcher, Hassan is comfortable navigating ambiguity from San Francisco to Dakar, and Juba to Karachi. She's big into design thinking and how it can transform the international development and humanitarian aid industries toward solving real challenges in direct partnership with communities being served. She's facilitated design workshops and led research and communications contracts across organizations, donors, and consortiums involving Internews, Tetra Tech DPK, UNICEF, CDAC Network, US Department of State, USAID, DFID, United Nations, and more. As a Pacific student, Hassan was selected to receive the 2005 Woman of Distinction Award. In January of this year, she was honored with the Outstanding Young Alumni Award from the Pacific Alumni Association. Hassan is a steering committee member of the East Bay Pacific Alumni Club and enjoys returning to campus to connect with and mentor students, especially women and minorities. Don't miss this exciting and inspiring event. Tickets are now on sale: $8 for students, $12 for general admission, and $60 for a table of 6 seats. They can be purchased at the DeRosa University Center front desk or online.